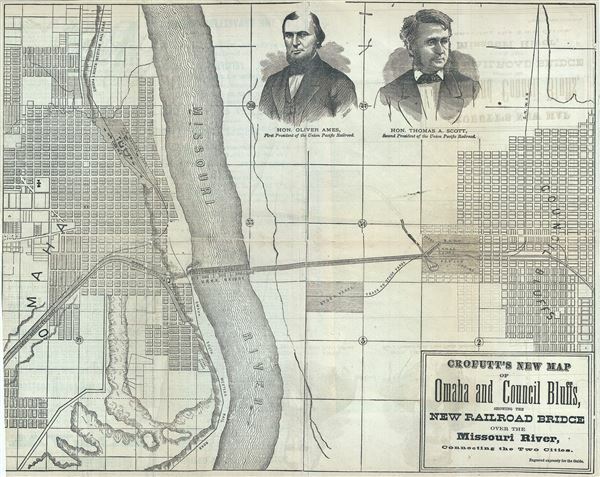 Crofutt's New Map of Omaha and Council Bluffs, showing the New Railroad Bridge over the Missouri River, Connecting the Two Cotoes. This is a scarce 1871 George A. Crofutt map of Omaha, Nebraska and Council Bluffs, Iowa, showing the railroad bridge over the Missouri River, connecting the two cities. Centered on the Missouri River, the map covers the cities of Omaha and Council Bluffs in great detail, showing streets, lakes, railway lines and topography. The bridge over the Missouri River includes an illustration of a train entering Omaha. The Union Pacific Railroad Bridge was the first bridge across the Missouri river. The bridge first opened in 1872, a year after this map was issued, but was damaged due to severe winds in 1877. It would go on to be rebuild in 1888 and in 1916. The upper right quadrant of the map includes portraits of Hon. Oliver Ames, First President of the Union Pacific Railroad and Hon. Thomas A. Scott, Second President of the Union Pacific Railroad. This map was engraved expressly for, and issued as part of Crofutt's Trans-Continental Tourist's Guide. Very good. Minor toning along original fold lines. Professionally flattened and backed with archival tissue.